3 , Cleaning method:back flushing. U- FC - J series tube bundle type automatic filtration system, the system automatically without parking regeneration of filter element, is a fully automatic self-cleaning filters, effective reduction of artificial cleaning, do not need to change the filter element, in the continuous production, high risk operation environment and operation unfavorable use ordinary metal filter, etc widely used. 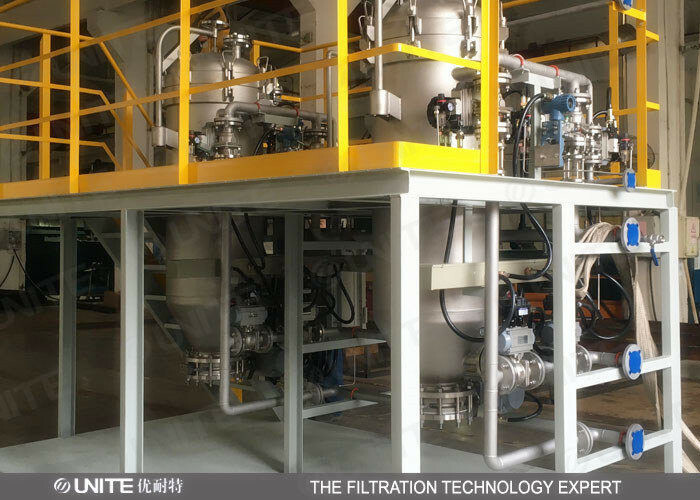 Filtering status: While filtering, filter material will be sent into the filtering housing by feed pump first; when it passes through filter cloth, solid particles will be stopped on the filter cloth. And as the solid particles growing,they will become filter cakes. Blow-back status: After filter operates normally for a period of time, namely when the thickness of the filter cake on the porous filter element reaches a certain value, the PLC will give an order signal to control material feeding (stoppage), fully expel the residual liquid in the filter, and then PLC signal control blow-back outlet (compressed air, nitrogen or steam) for back flushing to make the filter cake fall off. Discharging status: After back flushing lasts for a period of time, open slag-drip opening for slagging, and then close it to get back to the initial state before filtration to get ready for the next round of filtration. More than 0.2 um particles one-time complete filter, filter design USES double entry structure, wide application, good filtering effect. 8, the whole process can realize full automation.